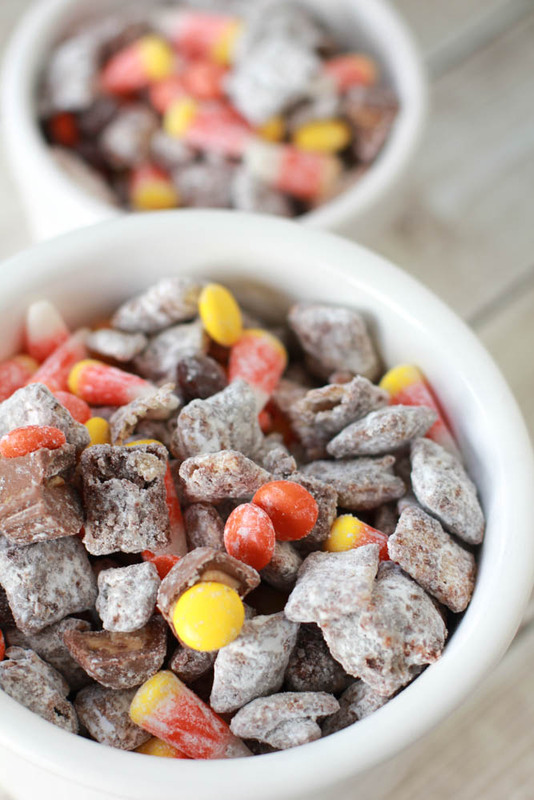 If you love a good Muddy Buddy Mix (some people call it Puppy Chow), you’ll love this super tasty Halloween Muddy Buddies Mix. It’s already that time of the year again. The leaves are beginning to change color and the temperatures are dropping, even in Texas. I walked outside yesterday and the cool air hit my face. It was an immediate reminder that my favorite season was over, and too soon I would be dealing with the cold winter weather that I dread every single year. But before I have to deal with gloves, puffy jackets and knee-high boots, I get to enjoy the wonderful fall weather and this Halloween Muddy Buddies Mix. Because – Halloween! Here’s a tip! Are you an Amazon Prime member yet? If not, sign up now. You get a FREE 30-day trial. During your trial you will get all the benefits of a member including FREE 2-day shipping! Y’all, that’s huge. Instead of going to the store for my pantry items, I use Amazon Pantry and have everything delivered to my door…while I’m still in pajamas! I love it. I don’t have to drag the kids out and we are all just happier people. If you haven’t tried it yet…TRY IT! You’ll seriously love it. It’s one of my life-lines, y’all! With all the Halloween merchandise on store shelves, I haven’t been able to stop the need for gettin’ busy in the kitchen (oh, not that way – gah!). In the last couple of weeks I’ve made Pumpkin Spice Rice Krispies Treats and Peanut Butter Pumpkin Spice Chocolate Chip Cookies. I’m lovin’ all these fun, festive treats. When I make special treats for my children, I excitedly look forward to their reactions. Their reactions are a big driving force for me. I adore seeing them excited, and to see their little faces light up with joy. When they walked into the kitchen and saw two big pans of Halloween Muddy Buddies Mix waiting for them, it was all I needed to get me through the rest of the day. Making a Halloween treat that uses candy corn as one of the ingredients is high up on my list since two out of my three children absolutely love candy corn. I could do without it, but since it’s one of their favorite festive treats, I include it where I can. And I love how colorful they are! Perfect for fall and Halloween. I’ll go ahead and warn you now that this recipe makes a pretty big batch of mouthwatering goodness. Like a seriously big batch. But it’s perfect for sharing. Give some to your neighbors, child’s teacher, friends, etc. It’s best for me that I get it out of my house as soon as I can because it’s very possible that I’ll munch on it until my stomach hurts. Hey! 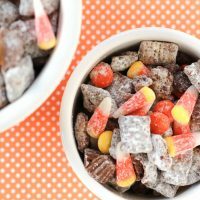 Why don’t you pin this really quick to your favorite Halloween board on Pinterest so that you’ll be able to find it when the mood strikes to make some yummy Puppy Chow for Halloween. Not that I know from experience though – thank goodness! 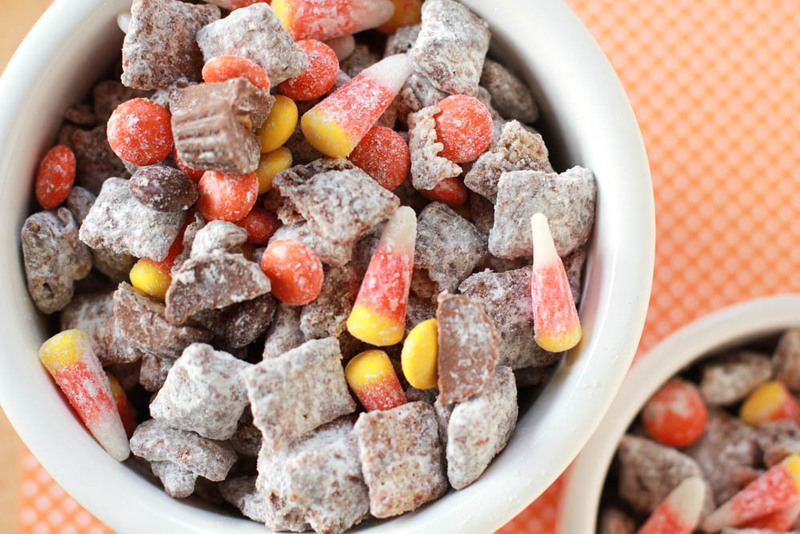 A fun and festive twist to the traditional Chex Muddy Buddies. 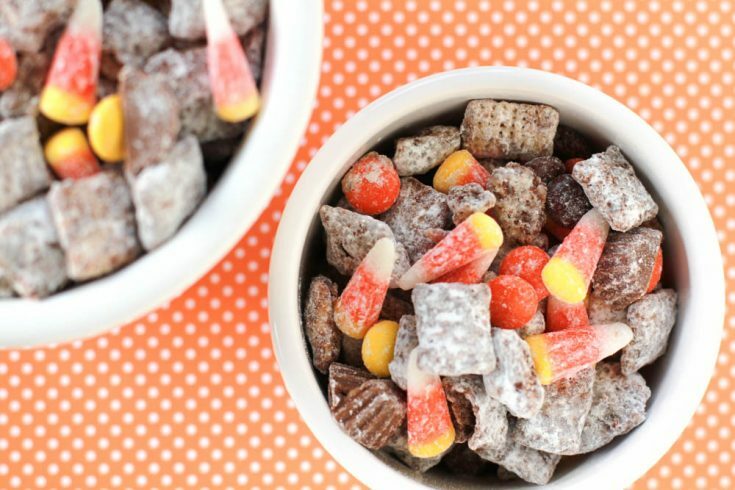 This Halloween Muddy Buddies Mix features some of your favorite fall treats. 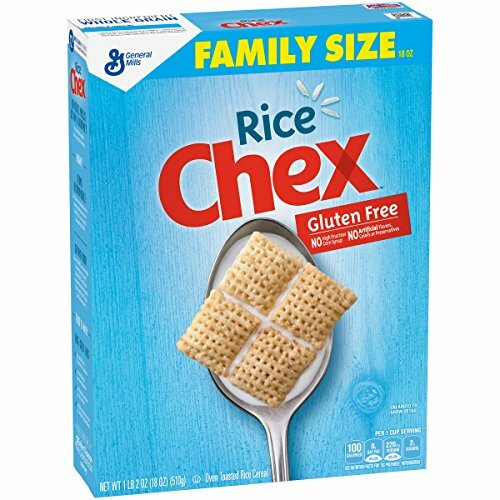 In a large bowl, add cereal; set aside. In a 1-quart microwavable bowl, add chocolate chips, peanut butter and butter and microwave uncovered for 30 seconds; stir. Return bowl to microwave and repeat until the mixture is smooth. Stir in vanilla. 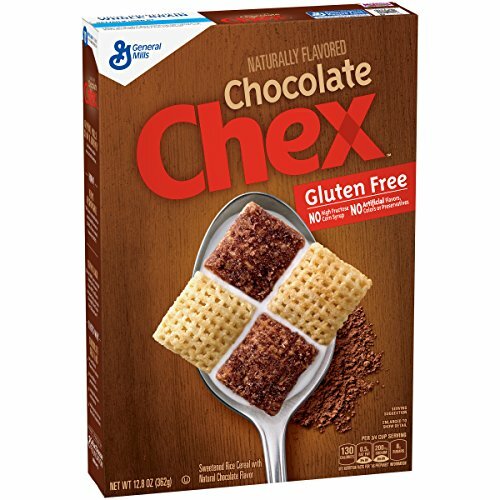 Pour chocolate mixture over cereal, stirring until all cereal is evenly coated. Pour into a large resealable food-storage plastic bag. I didn't have one large enough, so I used two bags and split the cereal between both bags. Add powdered sugar, seal bag, and shake until cereal is well coated with powdered sugar. 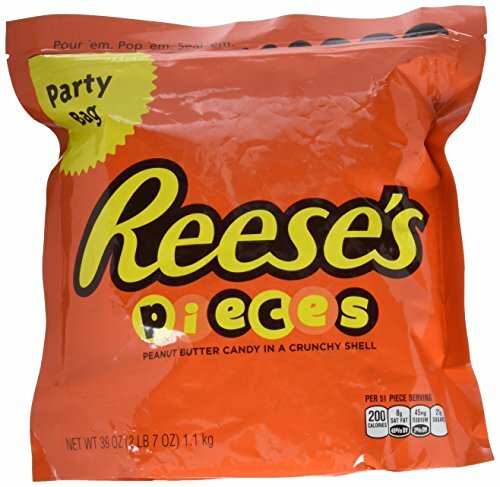 Add candy corn, Reese's Pieces, and Reese's Minis in the bag and shake until evenly dispersed throughout. Spread onto waxed paper to cool. Store in an airtight container in the refrigerator. The inclusion of Reese’s Pieces and Reese’s Minis was all for me y’all. I can’t get enough of the peanut butter and chocolate combo, and it just helped that they added a little extra color. I love decorating for Halloween, but the candy and treats are next. This sounds like something perfect to have on hand for munching. I love all the decorating!! 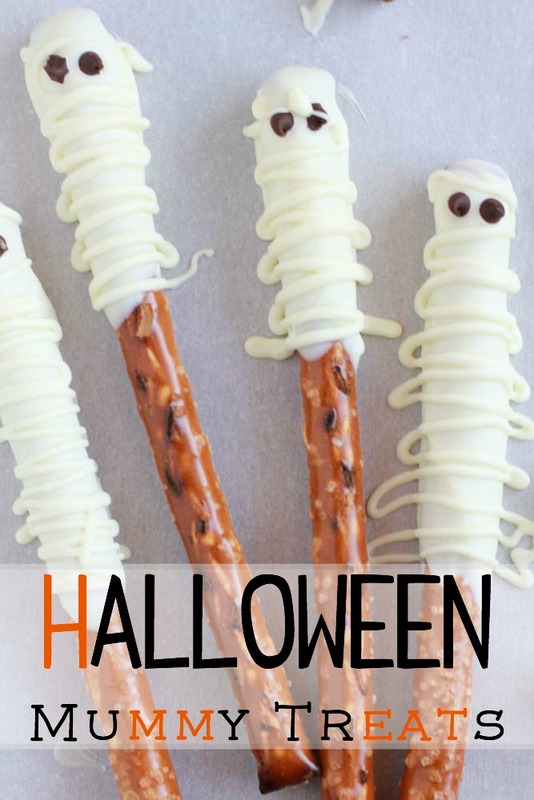 What a fun and tasty treat for the kids this Halloween. Think I am going to make up some and take it to co-op with me. 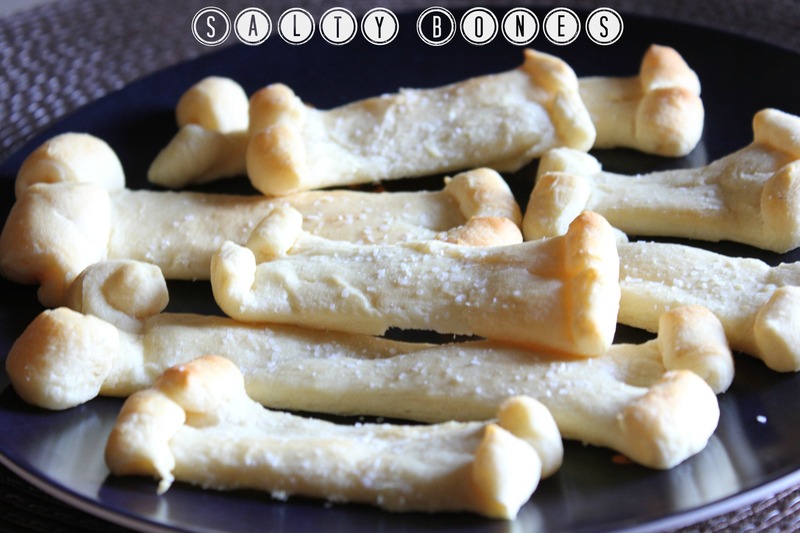 Would make a perfect snack for a kids Halloween party. This looks really good. I would not thought about putting these together, but now that you have it looks like a snack my kids and I would really enjoy. Thanks for this idea. YUM! This looks so good, so many great combinations. We love puppy chow (that’s what we call it in our house). I usually make it at Christmas, I never thought to make it for Halloween! I just made something similar! My family is addicted to Muddy Buddy Mixes! 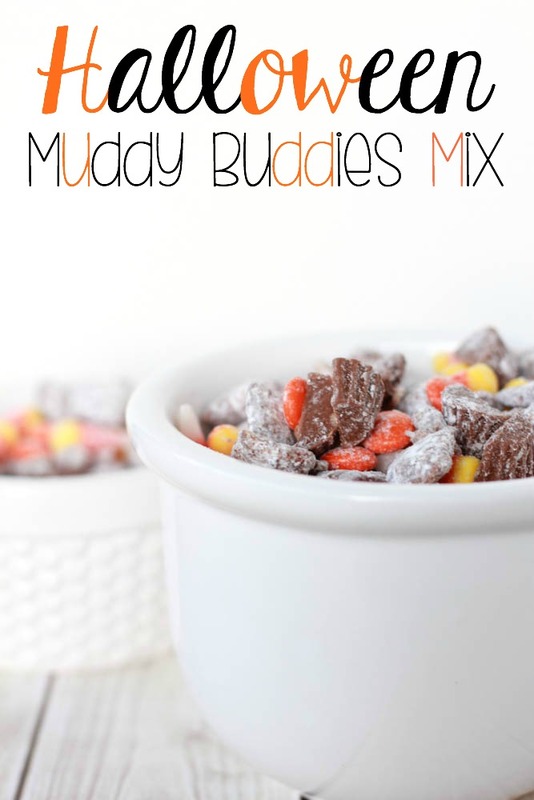 “Muddy Buddies” mixes are always so yummy! I haven’t made any in a while so maybe a small treat for the kids is due soon! Muddy Buddies (Or Puppy Chow as I call it) is one of my favorite recipes. It’s addicting though. Halloween is my favorite holiday, I love all things about it from the costumes, decorations to the foods. Can’t wait to try making this for the kids. We are staying home this year and having a party at home among ourselves so this should be a good treat for movie night. I love the candy corn addition to the mix because you do not see that very often. My favs are Reeses’ so yum! Omgosh I’ve just died and gone to candy heaven. This would make for a great ghouly movie with the kids on a stormy Friday night. Thanks for the recipe. What a fun Halloween treat! My husband would definitely love this! what a great recipe! Can’t wait to try it with the kids. Oh my, how mouthwatering is that!! I love the twist on muddy buddies! I love walking around the neighborhood and seeing all the kids dressed up. We are going to make this! What an adorable idea! Halloween is our favorite of the holidays! Wow, I bet my kids would totally love this! I love Halloween. I love everything from the costumes to the fall food. This looks amazing! Perfect for this time year, and how yummy it looks! We actually do not celebrate Halloween. 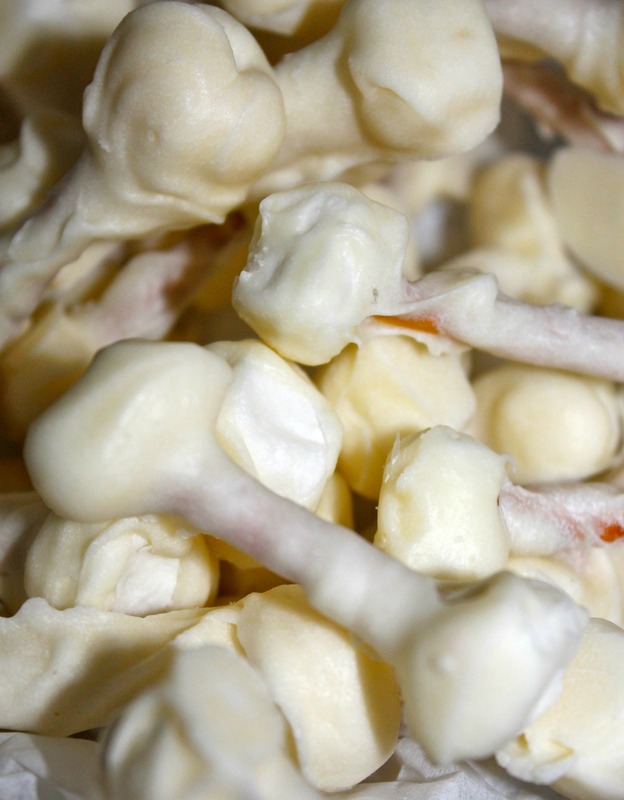 We tend to watch a movie and eat popcorn! 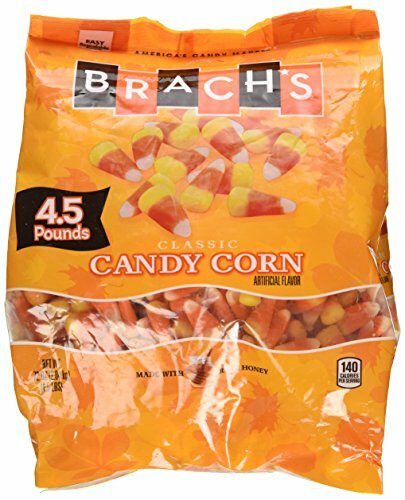 This looks so good, one of my favorite parts of Halloween is the Candy Corn! You have made it even better. I’m going to try to make this with the boychild for our halloween party. Love it. This mix looks so tasty. I’ll have to make it for our Halloween party. I love different varieties of Muddy Buddies and this Halloween version looks fun and delicious.